With Ruth Peacey declared Birdwatch readers’ Conservation Hero of the Year, we asked her about her life as an activist, protecting migratory birds and confronting illegal hunters. 1 Congratulations on being voted Conservation Hero of the Year by Birdwatch’s readers! What does the award mean to you? It means so much! I make conservation films because I want to raise awareness of the under-reported issues wildlife faces and ultimately make a difference in terms of helping reduce those problems. Hopefully this award means that the people that voted have watched those films or at least learned more about the issues – particularly the problems facing migrating birds across the Mediterranean, in Malta and Cyprus for example. It really means the world to me that I was even nominated, so thank you to everyone who voted for me to win! 2 Could you tell us a bit more about what you do in your work as a wildlife documentary producer and your conservation work? I’ve worked on films for the BBC’s Natural History Unit for over a decade. It was my ambition to make wildlife documentaries and I’ve been fortunate enough to travel the world filming all sorts of wildlife. As a natural history documentary film maker, my job is to tell stories primarily through filming animal behaviour. I do this by liaising with scientists and naturalists to find newly-discovered and interesting behaviours, plan shoots (exactly what I intend to film and how I want to achieve that with kit and logistics) and then head out into the field, often with a fantastic team, to capture it all on camera. It involves team-work, a lot of patience, problem-solving and field skills. It’s such a privilege to experience these things first-hand and to share what I’ve seen with potentially millions of people. But I’ve often been frustrated that there isn’t enough opportunity to make films about conservation within the mainstream TV industry. I teamed up with Chris Packham to make such films and campaign with it. We both believe in empowering the audience to do something to help, not just putting across a message of doom and gloom. We started in Malta and went from there – all this has taken up pretty much all my spare time for the last few years! I did get a programme on BBC3 (Undercover Tourist) about the problems migrating birds face in Cyprus earlier this year, which was great but they didn’t want to include some of the hardest-hitting scenes, which was another point of frustration. I recently started working for Lush, where my role is focused on conservation filming. It’s inspiring to work for a company that doesn’t just talk about making the world a better place but actually does everything in its ability to achieve that. 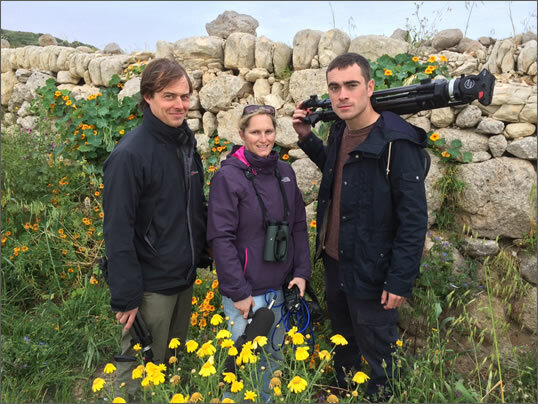 Chris Packham's production team on his protest trip to Malta (left to right): Jez Toogood, Ruth Peacey and Luke Massey. 3 You’ve been confronted by hunters in places such as Malta – what was that like? It’s not the best experience! I’ve had hunters or their associates try to run me off the road, shoot at me while I’ve been driving, as well as physically intimidate me. But the thing is that these people are criminals who rely on intimidation to try and stop locals from standing up to them. It would be awfully hypocritical if I let them get the better of me. At the end of the day, I know what I’m up against and I’ll always stand up for what I believe in. It’s definitely worse when you’re by yourself. Most of the time, I work with a close-knit team that I trust, including locals on the ground, and that makes a huge difference as we’ve all got each other’s backs. 4 You’ve got a very impressive CV, from filming birds-of-paradise in West Papua to penguins in the Antarctic. What was your favourite, and if you could choose any bird species to film what would it be? Honestly, everything I’ve filmed has been special. That sounds like a cop-out but it’s completely true – you will find the remarkable in anything if you take time and appreciate it and, luckily, you generally have that time when you’re filming wildlife. Having said that, I am somewhat mildly obsessed with penguins so living with a colony of Gentoo Penguins for a whole breeding season was my absolute dream come true. As for what I would choose to film, well I’m torn. My heart will always be in a penguin colony and I really want to see all 18 species. I’d also love to film Hoatzin as that’s an interesting species that would appeal to a wide audience, as well as being a good tick for me!! Ultimately though, I dream of a day when I can film European Turtle Doves on my local patch in Somerset, because that would mean that conservation efforts across Europe have been successful for this species. Turtle doves are probably my favourite British bird, being beautiful to look at and listen to and, certainly until recently, totally underrated by most people. Watching and filming them being shot on migration in Malta is one of the hardest parts of the work I do. 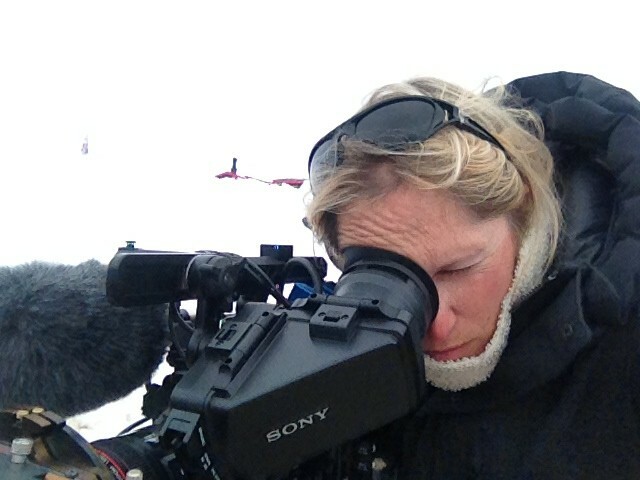 Ruth Peacey filming in Antarctica. 5 What are your future plans for conservation activism? I have a huge list of things that I’m working on and that I want to get stuck into! Chris and I want to expand our filming across the Mediterranean and continue to keep the pressure on Malta and Cyprus. We’ve got a few trips being planned for 2018. And, of course, there’s a lot to be done here in the UK too, which I’m working on in conjunction with various people. I’m looking increasingly at global wildlife crime issues and hope to include and encourage more people to get involved, because it’s just amazing the difference you can make with just simple kit, or even just your mobile phone and social media.